Do catchphrases catch on anymore? I’m too far off the popular culture beam to have any idea. Sometimes I’ll use antiquated expressions to mostly bemused response. The cleverest of them still work. Others are best left moldering. I Faw Down and Go Boom (explored previously here) is among the latter. Rusty-thatched ribber (yes, someone actually called him that) Red Skelton had trunkfulls. His radio show pitched a plethora against walls hoping some would stick. One that did (and how!) was uttered by Skelton alter ego The Mean Widdle Kid. If I Dood It, I Get a Lickin’ … (he does it) … I Dood It! Get it? Now make for the streets and repeat (often) to passerbys. Will you get a lickin’? Sure nuff. They’ll dood it! I think I need a break from this doodling. Maybe an in-patient one (and Word’s spell check is tripping over my repeated use of Dood … It’s Murder, I Say!). Then-kids must have been plenty obnoxious about the house after listening to Skelton. I’m pretty insufferable here just for having watched I Dood It, then revisiting some of Red's radio programs. How pervasive was this line? Well, the day after Lieutenant Colonel James H. Doolittle raided Tokyo on April 18, 1942, many headlines read Doolittle Dood It. Cartoons, mostly from Warners, pillaged the phrase and near wore it out. Ann and I watched No Time For Love last week and Fred MacMurray borrowed it. 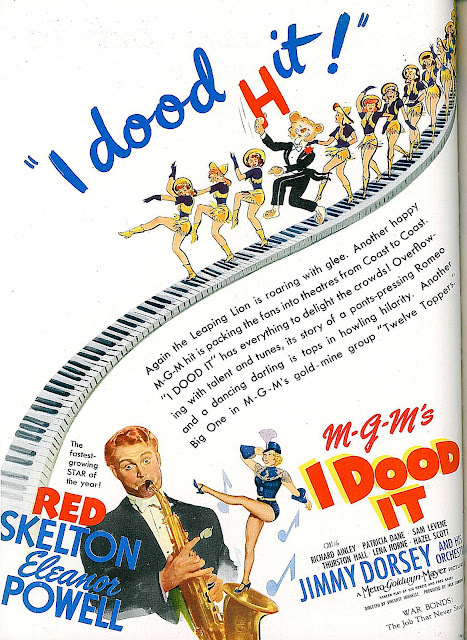 Then of course, MGM signed Red and ultimately made a wartime hodgepodge in swingtime called … well, naturally it was called … I Dood It. Warner’s Archive is recently out with that. Those who want an intense 40’s pop culture injection need look no further. And that’s a complement, by the way. I like entertainment so topical as to exclude most everyone nowadays watching, especially when it’s zeroed in on eras I prefer to my own. Just get with the I Dood It program, forget its inanities, and savor the air of those whose days and nights were spent following Hit Parades of the moment, be they radio, bandstands, or song sheets from which this show derived (and vice versa). 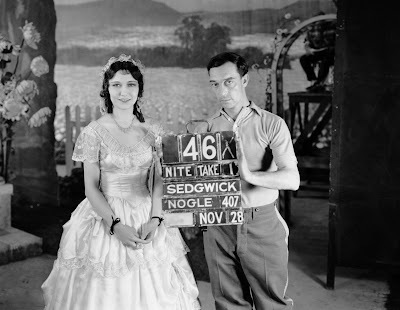 I Dood It had story origins in Buster Keaton’s Spite Marriage. The set-up never appealed to me for undercurrents of cruelty running through Buster/Red’s relationship with respective femme partners (Dorothy Sebastian in 1929, Eleanor Powell for 1943). Girl marries boy to spite (hence original title) the (unworthy) man she prefers almost till narrative’s end. Both involve wedding nights unconsummated and lead comics mistreated by unsympathetic leading ladies they’re unaccountably daffy over. Operating on a life’s assumption that buffoons have feelings too, I’m off-put seeing Buster/Red treated this way, especially as both versions redouble antagonists (bootleggers in Spite Marriage, saboteurs in I Dood It). 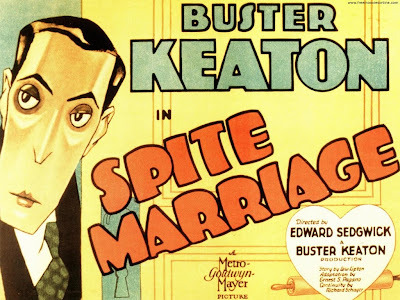 The dreaded Elmer in Keaton was incubating as this last of his silent features glimpsed the departing Buster of yore, providing (just) enough worthwhile comedy to make Spite Marriage fun. Only Keaton’s vigilance prevented its sinking altogether into plot contrivance that would in fact swamp I Dood It. Singularly ironic was Keaton toiling in both versions, the first as lead star, the second as wage-earning "gag consultant." Was that his job description with MGM as of 1943? I’d like to see the contract, if there even was one. Keaton tells in his memoirs of Eddie Mannix starting him at $100 per week around the late thirties. Before long I was getting $300 a week, he recalled. Buster’s function was on the lot trouble-shooting. He sat in an office, often idle, and waited for someone (anyone) to call down and summon him to fix humor deprived bits. Bright spots we got in many Metro comedies (and light action romances like Too Hot To Handle) were courtesy Keaton applying laugh support. He was appalled by non-existent work ethics of comics under contract, but took an interest in Red Skelton and saw there a talent to climb places top-liners like himself once scaled. Would Metro let Keaton guide Red to clowning greatness? The answer was an expected No. Buster wrote of his conference with Louis Mayer. The comedian had never articulated a position with such fervor and eloquence, all that wasted before a man committed most to keeping a now lowly staff employee in his proper place. Sad to think of all the useful ideas Keaton offered during the forties to so few that listened. 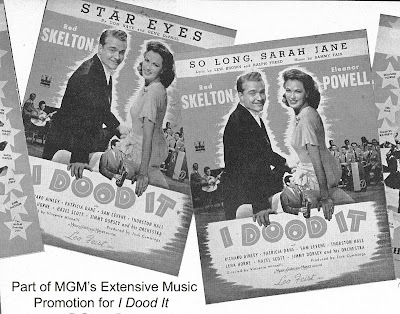 He was brought onto I Dood It to help Red Skelton recreate some routines Buster had performed in Spite Marriage. Uncredited, of course. You never saw Keaton’s name in a Metro 40’s credit save odd occasion when he was supporting onscreen, for example In The Good Old Summertime, or as director of a few shorts Louis Lewyn produced and Metro distributed. A crueler jab I found was in The Lion’s Roar, a lavish magazine MGM published at the time covering I Dood It for benefit of exhibitors and whatever fans came across it. They devoted a section to one Wilkie Mahoney, a specialist in streamlined humor who’s devoting all his energies to the happy task of making Red Skelton fans explode with longer and louder guffaws. I thought at first this guy might be a nom-de-plume for Keaton, but no, there really was a Wilkie Mahoney and, according to the imdb, he worked around MGM at the time. Said Metro: He was responsible for most of the gags in "I Dood It," and if the reaction of preview audiences is accurate, scored a series of bulls-eyes. 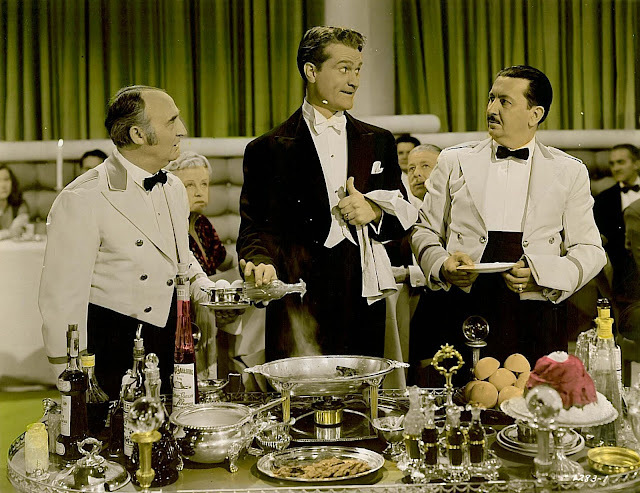 Mahoney was said to be adding piquant sauce to comedy scenes, his stated aversion the gag-pilferer, the gentleman of flexible standards who is content to pass off someone else's creation as his own. Such poseurs ... don't even belong in the outskirts of burlesque. Well put, Wilkie, but did they belong on the same lot with Buster Keaton, taking bows for work this humbled genius was doing sans recognition other than a living wage? What a place was Metro. As Keaton’s suggestions got a bum’s rush out of every executive office, publicists there were extolling Wilkie Mahoney as an exceptionally useful citizen to have around. MGM was oiled thick enough to sell anything by the forties, with music a soothing accompaniment. I Dood It plugged songs and the songs plugged I Dood It. The rest, including Skelton’s foolery, mattered less. All Metro’s comedies from that period Pied Piped to banks shaped like jukeboxes. Every clown from Abbott and Costello to the Marx Brothers boosted tunes, for these sold way round mere perimeters of a theatre. Awareness was assured by planting melodies months in advance of opening, per MGM’s relationship with the Leo Feist, Jr. publishing firm, a promotional juggernaut that made Metro’s own publicity unit seem like pikers. Feist was Tin Pan Alley Headquarters and generated hits through relentless power of suggestion. You could reasonably add a quarter-million to a feature’s take for songs therein that clicked. Getting on "most played" lists at music stores and radio stations was a process carefully manipulated once tunes were set for upcoming Metro pics. I never realized what a sap I’d been for imagining I picked favorites on my own. How long has this been going on? Since recorded sound began, apparently. Star Eyes was the I Dood It number picked to go places. Evidently, it did, because I still hear it often on Sirius 40’s satellite radio, not realizing it began life in a Red Skelton movie. 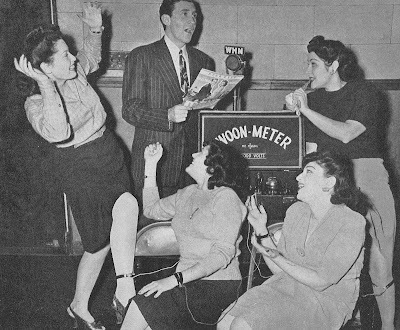 The swooner crooner shown here is Don Saxon of broadcast station WHN. He’s testing faint inducing potential of Star Eyes on a Bevy of Beauty (note girl’s wrists and ankles wired to the Swoon Meter). I could be cynical and deplore such mass-hypnotism, but this kind of spirited salesmanship is hard not to like. 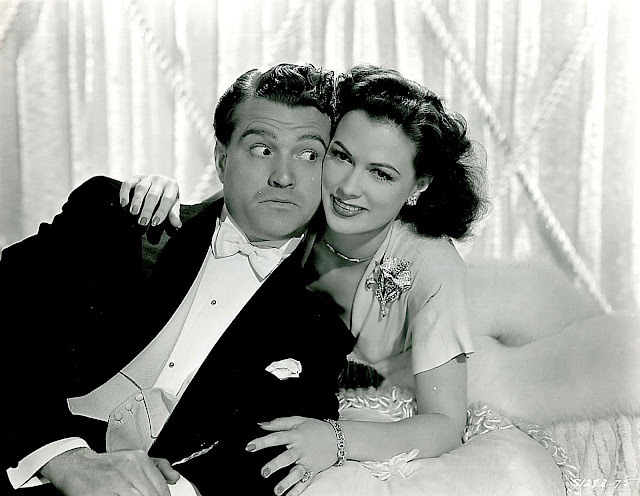 I’ll not leave the topic of I Dood It without mentioning Eleanor Powell. She dances up an absolute storm in this. There’s a particular number with lassoes (So Long, Sarah Jane). If someone tried it today, they’d need CGI, and afterward CPR. For that, the woman rehearsed sixteen weeks. I don’t think this is publicity blab either. Faux talents in High School Musical Three pulling off such a routine would be hoisted upon shoulders to collect a special Oscar. Amazing how miracles were so taken for granted then. Metro oddly reused several set-pieces out of prior Honolulu and Born To Dance to augment Powell’s dance card in I Dood It. Was she so exhausted from her rope tricks (worth getting the DVD just for that, by the way)? Director Vincente Minnelli (surprisingly) didn’t take credit for this highlight. He was assigned I Dood It in the wake of successful first film Cabin In The Sky and noted (in his book) Skelton’s insecurity. I’m not funny, cried the comedian during rushes. So is Red funny? I never found him notably so, even as a ten year old (me, not him) watching CBS on (to best recollection) Tuesday nights. There was something lachrymose about those God Bless sign-offs, worse when he’d check out for summer break (one year being so emotional I thought he was leaving for good). The features work better for me, and there are pretty good ones. Excuse My Dust warrants Warner Archive release (Red’s character could almost be Dean Stockwell’s Happy Years neighbor, so alike are pics in setting and costume). Watch The Birdie is interesting. Red, as a camera store employee, at one point checks out Clark Gable in Boom Town on 16mm (!). Much of WTB borrowed from The Cameraman. Buster Keaton had a hand in most all the Skeltons, Wilkie Mahoney’s useful citizenship notwithstanding. There's a great sight gag in "A Southern Yankee" (1948) where Red is carrying a two-sided flag (Union and Confederate) between the enemy lines and receives cheers from both sides...until the wind blows and reverses the flags. That always struck me as Keatonesque, and wondered if Buster came up with that gag for the movie. Nice post, John. 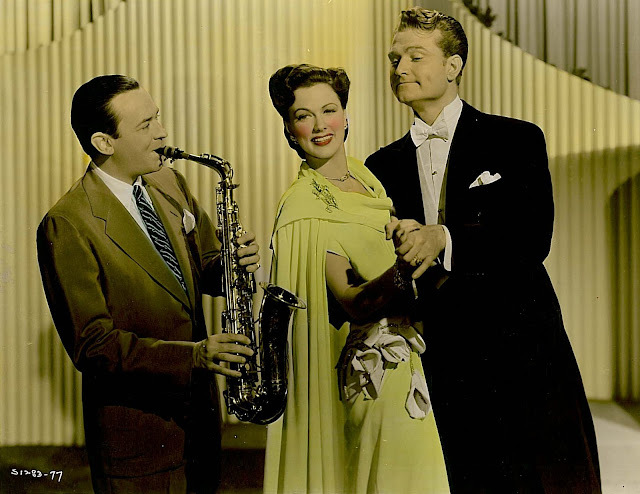 I found it particularly interesting in light of a project I'm now working on for Radio Spirits, a CD collection of Red Skelton broadcasts from around 1942. I love listening to Skelton on radio and he made a few decent pictures at M-G-M...but like you, I never cottoned to him on TV. Most of his successful radio characters didn't transition too well--for example, his "Junior, the mean widdle kid" characterization came across as a guy wearing a Little Lord Fauntleroy outfit with a severe case of arrested development. I think that was Keaton's gag in "A Southern Yankee", Kevin. He talked about it in either his book or the Rudi Blesh one. 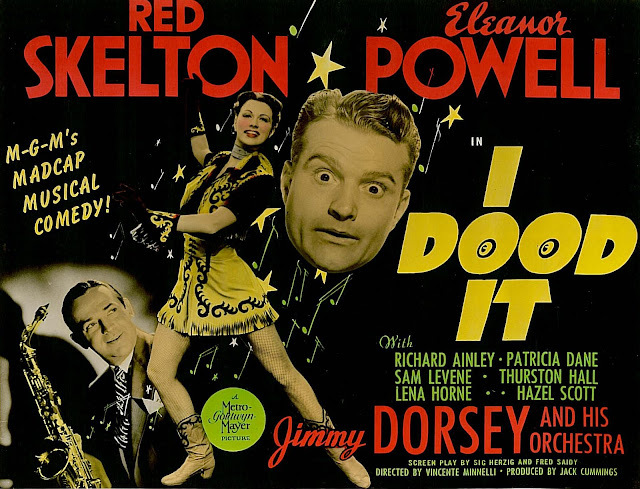 To me Red Skelton was only funny doing pantomime. He had a few classics, like the astronaut getting stranded in space or the boxer. When he speaks he's too corny snd he mugs too much. My opinion anyway. On the DVD set with Cameraman, Free & Easy and Spite Marriage, there's a documentary about Keaton's MGM years. At one point Keaton mentions Skelton and says, with a little exasperation, "Skelton always wanted to talk. He didn't HAVE to talk." One would have liked to see the two actually working together: deadpan Keaton and man-of-a-thousand-goofy-mugs Skelton, two gifted physical comics with directly opposite styles. Skelton, for all his pantomime gifts, evidently had the insecure standup's need to keep the one liners flowing. Mark Evanier at Newsfromme.com has some stories of Skelton going into full monologue mode at the drop of a hat, and the director's commentary on Those Magnificent Men and the Flying Machines notes that Skelton filled long waits on the set by pitching nonstop gags at the crew. Two big features of his old CBS show were the shameless milking of gags ("Here it comes, folks . . .") and the "spontaneous" giggle fits by Skelton and his fellow performers. I look forward to seeing more Skelton on DVD. A lot of them are strictly off-the-shelf comedy vehicles (oaf tries to impress girl, or is cruelly fooled into thinking he's competent, or get mixed up in mystery . . . ), but at his best he's a Jerry Lewis who isn't shouting how brilliant he is at playing dumb. Always loved Skelton in the movies and on the tube, but no question MGM thought comedians, even their top one, were something you plugged in between production numbers. His three WHISTLING mystery comedies were probably the funniest things he did at Metro but he did make one genuine comedy classic over at Columbia... THE FULLER BRUSH MAN. This one was, I believe, a big box office smash and with no sign of Eleanor Powell or Esther Williams. VERY broad, VERY corny and fall down funny. MGM grabbed Red back and started doing not-quite-right knock-offs like YELLOW CAB MAN and WATCH THE BIRDIE, while Columbia tried doing the same without Skelton (GOOD HUMOR MAN, KILL THE UMPIRE, etc.) Funny, funny man. "but at his best he's a Jerry Lewis who isn't shouting how brilliant he is at playing dumb." Or is he an Ernest Truex dialed up to manic levels? I saw him at the Kansas State Fair in the 80s. The only thing I remember was an odd rant about how we shouldn't call drugstores drugstores because it just encourages kids to think of drugs as normal. (A new variation on the Jack Webb-style domino theory of drugs-- you start out going to CVS and pretty soon you're smoking reefer...) But, cool to have seen him, anyway. Nice piece, but Skelton is one of those comics (like Danny Kaye) whose "charm" has always eluded me. With the exception of "Guzzler's Gin," I can't think of anything I ever saw him do that made me laugh. I must be in the minority, though. Rockfish, I don't disagree with what you say about the Warner Archive, and I have been disappointed with a few of their releases, quality-wise ("Dream Wife" and "I Love Melvin" come to mind). I do think that overrall the program has been a success, especially in terms of scope and widescreen titles that are very nice indeed ... and how would we ever have gotten things like "Top Secret Affair" and upcoming "Untamed Youth" otherwise? The wide releases all tend to come from newer transfers and are as good as pressed DVD's would ever have been. So far, all my DVD-R's from them have played fine. Maybe I've just been lucky in that respect. One thing's apparent: the old days of lavish box sets filled with extras is gone-eroo. Too bad about that, though Universal and Columbia seem lately to be willing to fill that void (have you seen the new Universal Cult Horror Collection? --- it's really nice). I really enjoy your blog. I appreciate not only the subjects you choose, your wealth of knowledge, your opinions on the people and movies involved, but also the unique and refreshing way that you write. For instance: "All Metro’s comedies from that period Pied Piped to banks shaped like jukeboxes." I greatly admire writers who play with words so well. Don't know if there are tons of catchphrases catching on nowadays. Lately, catchphrases tend to come from TV for the most part, thanks, I guess, to TV's availability to almost everyone. "Doh" from Homer Simpson was big for a while. I have not seen much of Red's film work -- I will need to check it out. When I was a kid, my family and I would occasionally tune in Red's weekly hour-long variety series. If there was a guest star we liked, we'd watch. Regarding Red's variety show: I never understood why he laughed at his own jokes. It was not the standard procedure. I suppose it had something to do with being a clown, which was one of Red's major concepts. But "the laughing at his own jokes" got it the way for me -- especially since the material was not always very funny. I did watch Red give one performance that was among the funniest things I've ever seen. My fuzzy recollection of when and where: Mid-60's maybe. Red was one of many performers appearing at an outdoor event in Washington, D.C., on the Fourth of July. I think this special was broadcast on WNET channel 13, and no doubt other channels, but this would have been before the formation of PBS. Anyway, the bit was this: Red is a politician who must deliver an important speech. He has the speech written down on pages that he has tucked away in his pocket. He pulls out the pages and starts delivering the speech with gusto. But the speech makes no sense. He soon realizes that he has brought the wrong pages. Instead of his speech, he has brought along his 10 year-old kid's homework. Red, as a politician unable to ad lib a burp, proceeds to deliver what's written in the homework as if it were a profound political message. If my memory is correct, my entire family found this performance roll-on-the-floor hilarious. If anyone has a copy of this, or another version of Red performing this routine, I'd love to see it again! When remembering Red's catchphrases, let's not forget "He don't know me vewwy well, do he?" and "I'm only three-and-a-half years old", both from the Mean Widdle Kid (and both immortalized in Warners' cartoons). I, too, always though Red was at his best when working silent. Oh, what Buster could have done with him. Wes Gehring wrote a fine book on Skelton, by the way, called "Seeing Red : The Skelton in Hollywood's Closet" Highly recommended. Tom, I'm getting the feeling that Red was a lot funnier in person than on television. I wish I'd seen one of his concerts. He did have North Carolina connections. Among other things, his daughter roomed on the same hall as my sister during college. ... and thanks for the nice compliments. They really made my day. 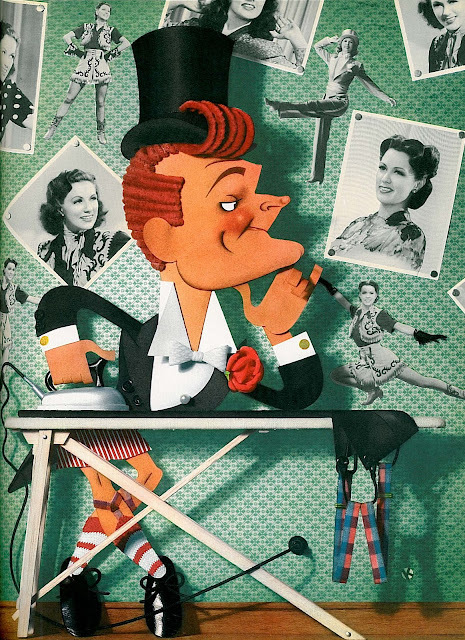 I've never known Red Skelton to be vaguely amusing. In fact, everytime I watch the episode of his show featuring the Rolling Stones, I want to strangle him. But I'd be very interested to see what you've got in your archives, John, relating to the immortal Steppin Fetchit.